This beautiful old-fashioned farm, completely refurbished in 2008, is a place where you can stay in spacious rooms that are comfortable for all occasions. 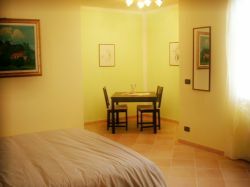 Relax yourselves in the peaceful, natural environment which surrounds Cascina Bellezza. An ideal stop over if you are travelling from one city to another as Casina Bellezza is easlily accessible to all major motorways. If you want to get away for a peaceful country vacation, yet want to enjoy city life, we are situated only 20 kilometers away from the beautiful city of Turin.